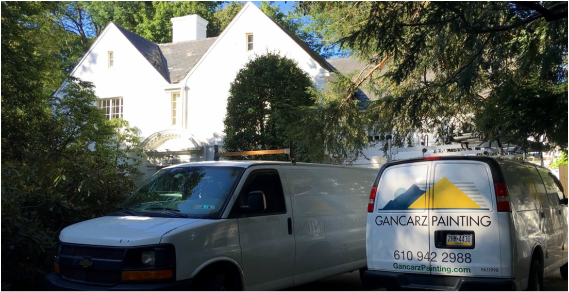 At Gancarz Painting we only use quality, professional grade materials and complete the job with a production process to match. We are also able to give you a custom estimate if you choose to use special order materials of your preferred brand or quality of product. Standard lead safe systems and practices are used on each job in homes built prior to 1978, where lead paint is being disturbed. Anything brought onto your property will be brought out just as carefully once the job is complete and all that will remain is your beautiful new finish. ​The correct preparation is key to a lasting, smooth and clean-looking finish. We always remove faceplates and if possible, any other objects that come in contact with the surface being coated. We move pictures, heavy furniture and other objects to the center of the room or out of the way where they are covered with painters plastic if painting the ceiling. Next, plastic or drop cloths are laid out along the perimeter, protecting every area of the floor/ground where any materials could come in contact. If painting exterior we also cover any landscape objects and even cover certain plants where needed. We also pressure wash exterior jobs to remove areas of mildew or dirt. Any damaged areas are then repaired and/or caulked as necessary. This includes any light carpentry or drywall repair. Repairs are sanded smooth when spackled, along with other areas of the project that require sanding, scrapeing or other types of specific preparation before coating. The way product is applied can make all the difference for your new paint job. Before application, the project is always taped where needed and tape is pressed down properly to best ensure that there isn't bleed through during application. Our skilled and experienced painters cut in most areas free-hand to be able compensate for uneven corners or prior unevenly painted surfaces and ensure the cleanest lines we can. Areas are primed when needed depending on the sheen or type of paint being used. Perimeters are cut in by brush unless we are dealing with a larger interior or exterior project which will be taped, covered, sprayed and backrolled if needed. Areas that are not being sprayed are rolled with the correct nap and a second coat is cut and rolled if necessary once the first coat has properly dried. After a final inspection and proper dry time, tape is removed. Faceplates, towel racks, curtain rods, etc.. are all screwed back into place. Drop cloths are then rolled up and brought outside. Using water-based paints, we usually use one of the sinks on the property (preferably a utility/laundry room sink) to be able to quickly clean brushes. After cleaning up all trash, which will be disposed of properly off site, any extra paint is poured back into the can. The can is labeled and placed wherever specified. Any of the tools or ladders will be brought outside carefully. We sweep, vacuum or mop anything seen and move furniture back as close to its original position as possible. Dust and debris are lastly wiped off horizontal surfaces. With our thorough production process, we hope that you are just as pleased as we are with the job we have completed.